“What a good man. Sometimes I think that's the best thing to hope for when you're eulogized -- after all the words and recitations and resumes are read, to just say someone was a good man.” These words spoken by President Barak Obama at the funeral service for Rev. Clementa Pinckney cannot be said about just any man.But you do know one when you see one.He is highly thought of in his community, his children are a blessing to their peers and elders, he is a tireless worker and an asset to any organization, and he loves his family passionately and sacrifices for them willingly.Five thousand people will brave heat, long lines and a four hour long worship service for a good man. “Start with a sip of cranberry juice first. If tea is served, use Splenda. Feed her with a spoon, not a fork. Make sure the food is not too hot or too cold. Make sure she gets a vanilla shake.” I can hear his voice every time I feed my Mom. My friend Brenda hears his voice too. He taught us how Katie Mae should be fed. He was not shy about telling me where I had gone wrong. He would stop me sometimes and just do it himself. He was the expert. 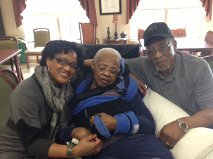 Before Mom moved to long term care, Dad considered cooking for Mom a privilege. I was not allowed to bring meals to the house. He would say, “She cooked for me for over fifty years, why can’t I prepare her meals now.” His labor of love has been passed to me. Ephesians 6:2 2 “Honor your father and mother,” which is the first commandment with promise. Why do shopping carts need protection? You’ve seen them in parking lots, lined up in a row corralled by guard rails. Why not leave them by your car or on the sidewalk? The next person will surely bring them into the store on their way inside. What harm can come from shopping carts scattered across the supermarket parking lot? If your car is marked with a ding or a dent on the door, you know what can happen. How about that space you thought was open but there is a cart sitting dead center. Run away carts can create a host of problems as unsuspecting drivers course down the lanes. Children and the elderly occasionally have to dodge unmanned carts. Left unattended and in the wrong place, carts can be dangerous. 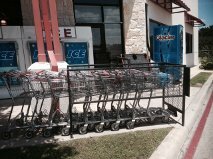 The carts are secured or under guard to protect people and property.